Meteorologists fill a weather balloon with hydrogen before it is released at the US Weather Bureau, Washington, D.C., circa 1935. Carl Rossby pushed back his plate of empty shells, drained his mug, and donned his still-damp trench coat, bidding his newest bosom buddies at the bar adjö as he headed out of the Union Oyster House into the snow, sleet, and freezing rain. The avuncular Swede, the leading meteorologist in the world, had a pressing appointment at the East Boston Airport with his MIT colleagues. During the slow cab ride through the slick streets, he recalled the path that had brought him to head the MIT meteorology department: Bergen, Norway, where he learned about cold fronts and polar air masses as an apprentice to the great physicist Vilhelm Bjerknes; Washington, D.C., where his new-fangled forecasting methods challenged the stodgy ways of the Weather Bureau; California, where he installed a model aviation forecasting system for the Guggenheim Foundation. Now, he was poised for yet another innovation in forecasting weather — not at the surface, but at 18,000 feet. With grants from the National Academy of Sciences and the Guggenheim Foundation, MIT had purchased a research airplane in 1931 to carry aloft a device that traced a continuous record of temperature, relative humidity, and barometric pressure on a rolling paper chart. For the past five years Rossby had used these measurements to identify dynamic features of the upper atmosphere. On this January evening in 1936, the weather made flying much too dangerous, even for experienced pilots. Yet it was just such severe conditions that were most disruptive to society and were of most interest to meteorologists. Rossby kept his head down as he dashed into the hangar, greeting his MIT colleagues K.O. 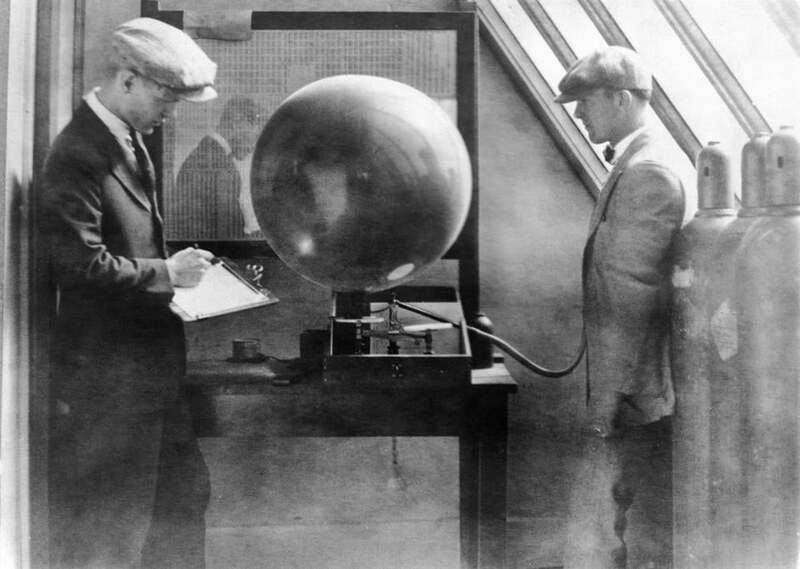 Lange, director of the flying laboratory, and professor Daniel C. Sayre, the veteran research pilot. A single-engine Cessna, Model A, the institute’s airplane, stood idle behind them. The center of attention, however, was Vilho Väisälä, a distinguished Finnish entrepreneur who was providing the best commercial “robot-reporters” or radiosondes. Rainy with a chance of CLOUDS! 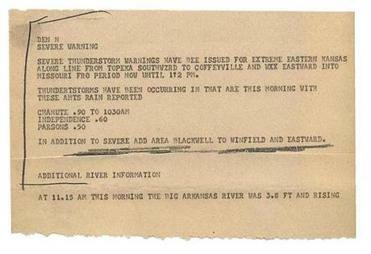 The National Weather Service upgrades will allow everyone to still get the same bulletins, without all the screaming. The new technology involved an expendable meteorological instrument package, borne aloft by a free-flight balloon, to measure, from the surface to the stratosphere, the vertical profiles of atmospheric variables and transmit the data via radio to a ground receiving system. According to Rossby, communications are the alpha and omega of meteorology. Early in his career, he had used Marconi wireless for signaling, but now radio was taking over in the form of miniaturized transmitters attached to balloons. The four men bundled themselves up and dragged (or more accurately, wrestled) a 5-foot helium-filled balloon onto the tarmac and let it fly. Almost immediately it disappeared, carrying its instrument package into the low-hanging clouds. But the receiving station in the hangar was humming, receiving continuous data until the signal was lost. Success! Helium-filled balloons could fly to 40,000 feet — much higher than piloted aircraft — and could be launched in virtually all weather conditions with no risks to aviators. As the balloon rose, it expanded and eventually burst. The small radiosonde package returned to earth on a parachute. The package had a postage-paid label instructing anyone finding it to return it to the Weather Bureau. Meteorologists quickly adopted radiosondes for daily weather soundings, immediately expanding both the height and the meaning of the term “atmosphere.” Specially equipped models carried cosmic ray, ozone, and ultra-violet radiation detectors, and eventually the technology was adapted for remote sensing applications and radio telemetry used in the space age, on rockets and satellites. Since a radio receiving ground station was part of every radiosonde launch, Rossby added courses in electronics as essential components of meteorological training at MIT. Rossby ordered 300 radiosondes that evening, enough to supply a network of 10 stations in New England for an experimental, monthlong project. He also ordered more oysters and beer for his colleagues by way of celebration. Rossby encouraged the Weather Bureau to begin a national network of twice-daily balloon launches, eventually numbering 200 per day. Rossby used such measurements to identify large-scale flow patterns in the upper atmosphere: planetary waves — often called Rossby waves — that have a direct influence on surface weather. This was perhaps his most important scientific discovery. Rossby moved in both geophysical and practical circles, first as a Bergen school acolyte, and then building models of planetary waves that circle the entire Northern Hemisphere at high levels. He inspired and mentored a new generation of theorists. During World War II, he trained thousands of army weather officers and consulted on practical meteorological matters worldwide. His toolbox included airplane soundings, radiosondes, digital computing, and networks for chemical climatology. He built three major academic programs — schools really — at MIT, Chicago, and Stockholm, launched several journals, and circulated in the highest levels of both the US and Swedish governments. Wherever Rossby went — and he went far — he was at the center of a moving seminar on atmospheres and oceans, surrounded by his many colleagues, nurturing a cadre of elite students, and holding court at the best dining and drinking establishments in town.